It's time for SPRING and Earth Day fun at Kind Elementary School! Several months ago, each member of the Lunch Bunch Club signed up to join an Earth Day club at school. During Earth Week at school, the students will complete special projects to take care of our planet. The problem is, all of the members of the Lunch Bunch Club forgot which clubs they signed up for! Oh no! Now, they are all MIXED UP! They wrote about the special projects they signed up to help with in their Earth Day journals, but they can't remember the names of the Earth Day clubs. Can your students use their inference skills to help the Lunch Bunch Club by working together as literacy detectives? Download the Preview File to see TONS of photographs and learn more about this hands-on and highly engaging April Earth Day literacy resource! 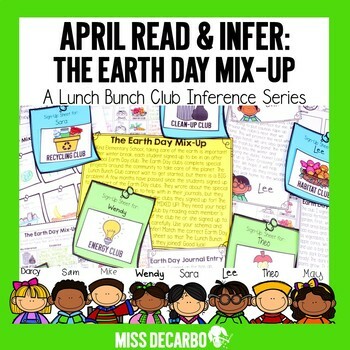 Join Sam, Sara, Mike, Lee, Theo, Wendy, Darcy, and May in this April Read and Infer edition of The Earth Day Mix-Up In each edition, your students will use their own schema and clues from the text to help the Lunch Bunch Club solve a big problem. My hope is that your students come to know these eight characters as “old pals” within your classrooms! At the same time, they will build important literacy skills as they infer, draw conclusions, make predictions, write about their reading and reasoning, and think critically. 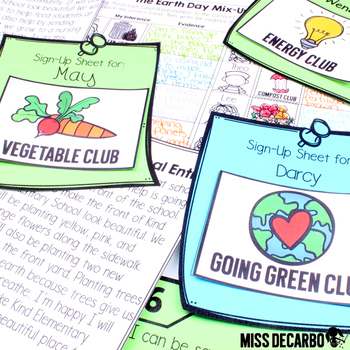 In April's Earth Day Mix-Up Edition, your students will infer what Earth Day club each member of the Lunch Bunch Club signed up to join. 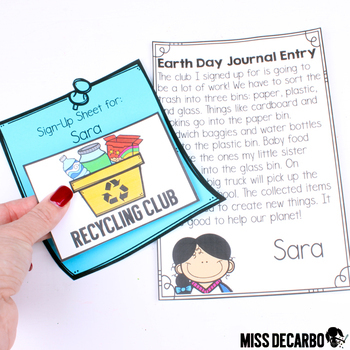 They can work as a whole class, a small group, or within a literacy center to match the name and picture of the Earth Day club to the correct sign-up sheet for each member of the Lunch Bunch Club. 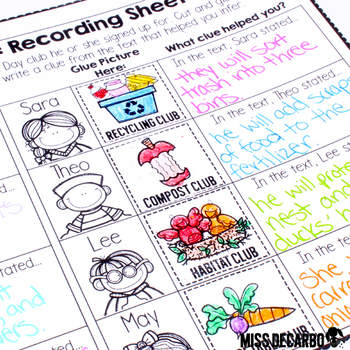 Your students will use their schema and the clues they read in each member's Earth Day journal entry to make inferences and draw conclusions. The pack includes TONS of differentiated recording sheets – choose the format or formats that best meet your students’ needs. Your students will be engaged in discussions as they infer and activate their background knowledge to analyze the clues. They will provide and write evidence in order to prove their inferences throughout several of the recording sheets. A writing extension activity is included within the pack, complete with blank templates for your students to write their own inference clues for one another. BONUS: Eight Earth Day inference riddle cards, with differentiated recording sheets, are also included! These inference riddle cards are the perfect addition to your mini lessons, small group reading activities, literacy centers, or independent fast-finisher activities. A riddle is included for each of the following topics: water, energy, trash, Earth, recycling, trees, animals, and air.